When I purchased and planted these three Potentilla last year, they were labeled Mango Tango, which refers to the orange streaks and centres on the yellow flower... however I'm not exactly seeing the orange on mine yet!! 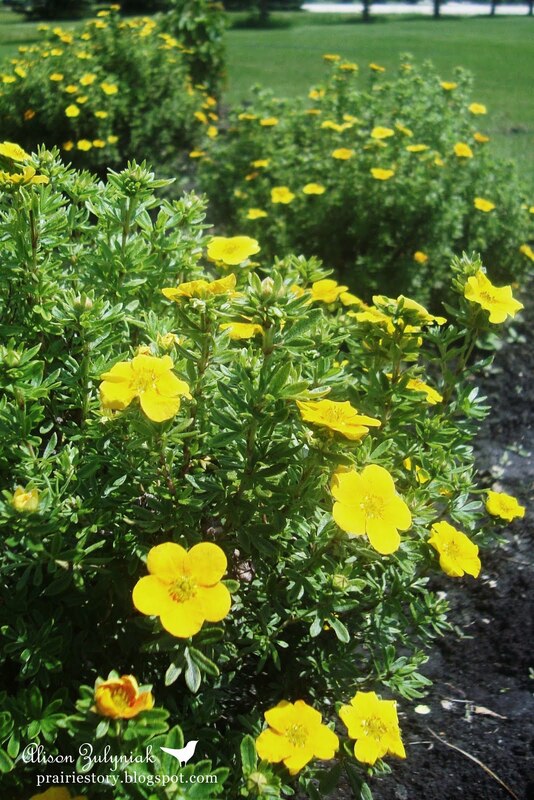 Potentilla are a dense, round shrub that is extremely low maintenance. It is hardy, adaptable and does well in full sun. The bright flowers (which come in several variations) attract butterflies but not deer. When I was working in this flower bed I noticed deer tracks all around, but the only thing they ate were some weeds! Now that I've seen first hand how well this little cute shrub does, I'll be planting more in my yard, perhaps some pink or red flowered ones! These are beautiful. Yellow flowers has always been my favourite!